Biathlon, an exciting mix of target shooting and cross country skiing, is the Number One winter sport in Europe and its popularity is increasing. Scottish biathlete and Eurosport commentator Mike Dixon says that between 100,000 and 300,000 Brits tune in to their coverage. It is easy to understand the popularity. Lycra clad gods and goddesses gliding around pristine snow covered forests and pastures, reaching speeds of up to 70km/h descents on skinny skis while carrying a 4kg long rifle. A single missed shot means a penalty loop, 150 meters of pain and shame that can turn a race on its head. However Biathlon is not so easy to get into, even in the Alps it is generally restricted to skiers on the elite competition track. That’s not surprising. You are shooting an expensive target rifle which fires rounds at supersonic speeds that can punch through wood, and bone! At the end of August I got the chance to spend 3 days training with current Olympic relay gold medalist Marie-Dorin and her husband Lois Habert (a European champion) at Correncon en Vecors. Marie has now retired and is expecting her second child in the New year. Obviously in August we were not on skis but on roller-skis. Roller skiing is the dry land equivalent of cross country skiing on snow. Skis are replaced with a shaft that is 53cm or longer with wheels at either end. They come in both skating and classic varieties. Classic skis having a clutch to stop them rolling backwards. The big difference with snow skiing is that, if you fall over, it hurts a lot more! If you are interested in knowing more about this sport I've put an article up on my website. 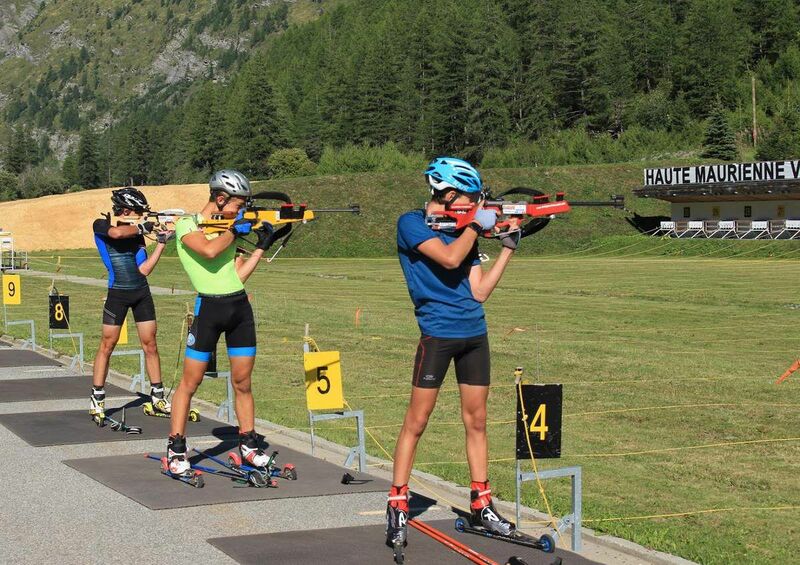 @davidof, I think you can do Biathlon on Megeve too, there is a firing range at Cote 2000. The posters for Biathlon that I have seen in Villard de Lans said that kids could do it too but using air rifles. As a skier & a shooter I have always had the greatest admiration for anyone who can ski like that then hold a rifle even remotely steady. Indeed. Most of the ESFs offer a biathlon taster, frequently with laser rifles on 10 meter ranges (esp. for kids) as they don't need a proper range. Sometimes on 10 meter ranges with air rifles or compressed air rifles and some do offer live round shooting. I don't expect there is much difference between shooting with a compressed air and a live round .22 rifle except cost (a .22 round for training costs about 25 cents). Hmmm... I'm sure I could improvise with all mountain skis, a frame binding and a 30-06.
the guy who crashed said it was due to the leaves on the left hand side but I think he just made an error, he had some nasty cuts and bruises after that little collison with the curb. Mrs M would be up for that. She likes a bit of violence with her XC. I've done a couple of sessions with them. my xc technique is lousy, but i can still shoot. it is probably one of the purest sports, based on hunting principles and contradictory in extreme... as others have pointed out, trying to shoot straight whilst absolutely pumped is the absolute challenge.